Morning sight seeing in Munnar visiting Pothamedu, Devikulam, Pullivasal, Attukad, Mattupetty, Echo-Point etc. Over night stay at Munnar. Morning drive to Thekkady Serene Countryside, rich plantations and dense forests, Thekkady’s beauty is veritably enchanting. The cool scented air of the western ghats divulges the unexplored beauty of the place. Thekkady has distinctive flora and fauna especially the birds that differentiate it from other sanctuaries across India. The smell of the spice-scented plantation envelops the city. On arrival check-into the Hotel. Rest of the day is free to enjoy by your own. Overnight at Hotel. Morning sight seeing in Thekkady visiting Periyar Wildlife Sanctuary, Murikady, Pandikkuzhi etc. Periyar South India’s most popular wildlife sanctuary and home to bison, antelopes, sambar, wild boar, birds and even the odd tiger! Kumli, close to the sanctuary and where you’ll stay, is a pretty little town dotted with small spice and handicraft shops. There is plenty to do in and around Periyar, so we leave the choice to you. 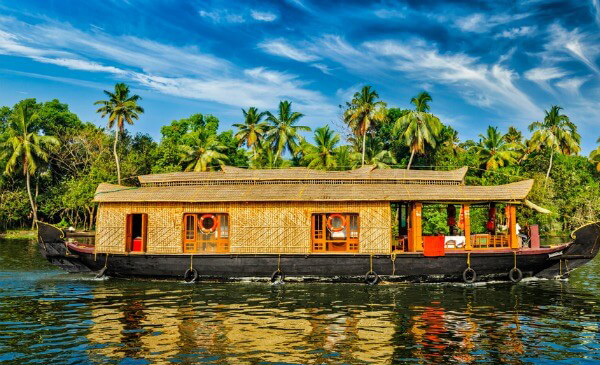 Enjoy an included boat ride on Lake Periyar to spot herds of wild elephants or visit the lush nearby tea estates. Overnight at Hotel. Morning drive to Kumarakom covering a distance of 125 Kms/ 04 Hrs. On arrival check-into the wildlife resort. Afternoon with Indian Horizons orthinologist visit the Kumarakom bird sanctuary. You can spot King fisher, Wood peeker, Drongo, Egrets, Bee-caters etc. Overnight at Kumarakom. Morning on arrival to Alleppey drive to Kovalam covering a distance of 175 Kms /04 Hrs. On arrival check-into the beach resort. Kovalam beach is known as the "Paradise of the South". Kovalam is just 16 kms away from Trivandrum, Kerala's capital city. Kovalam is an evergreen and pleasant climatic beach resort.. With high rock promontory and a calm bay of blue waters, this beach paradise creates a unique aquarelle on moonlit nights. Kovalam was brought to the public eye by the Maharaja of Travancore. Over the past three decades, the place has been well developed, and now figures prominently on the world tourism map. The warm and clean atmosphere by the coconut trees and the white sandbed are perfect for relaxing holidays, as the sea breeze gently plays with the waves. Overnight at Hotel. After breakfast at hotel, in time you will be transfer to Trivandram Airport for your flight back to home.